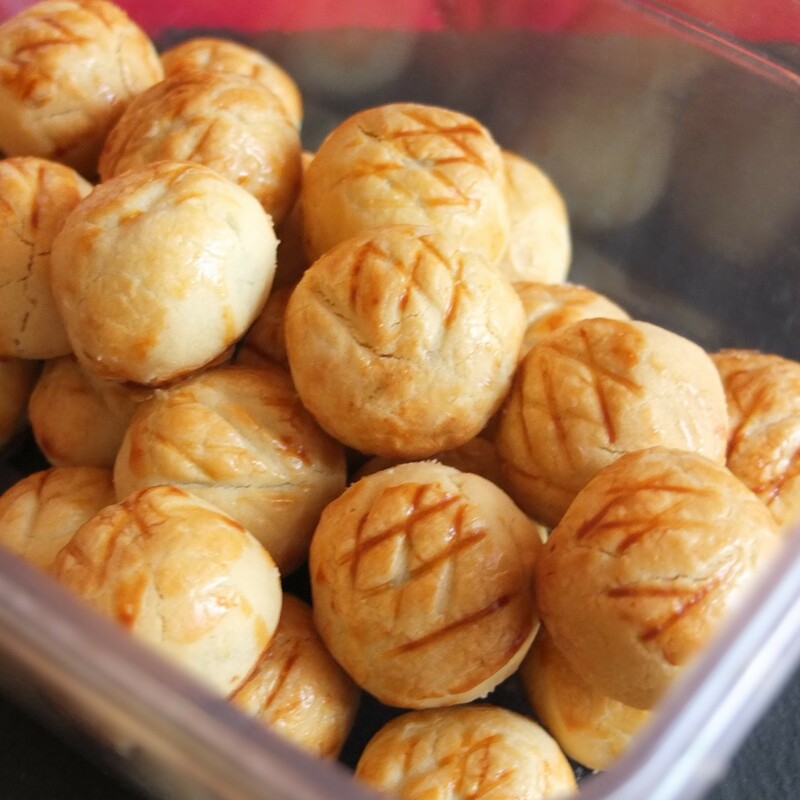 I made hundreds of pineapple tarts last year but wasn’t totally convinced by them. Now by jove, following further experimentation with four batches this is my near-perfect recipe (mua ha ha, crazy scientist laugh). There are actually other bloggers chasing the elusive perfect tart with four or five different recipes posted, including the latest BEST EVER ones!! 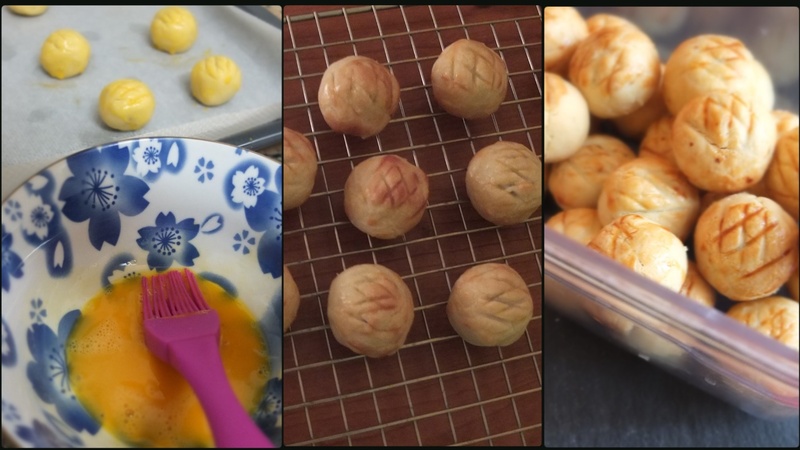 Mine are inspired and adapted from a combination of different recipes on Rasa Malaysia’s blog, the Dumpling Sisters’ book and other sources. I hope to get together with my Indonesian sister-in-law one day and make some under her expert guidance, probably the BEST EVER ones!! Meanwhile these are an absolute delight and just like I remember them! Surprisingly so. I did a little victory dance after eating three of them (just to triple-check) then shouted ‘Yay!’ and ‘Hurray!’ My friend loved them. She was astonished at how soft and delicious they were. Perhaps looking at them you don’t appreciate their extreme yumminess? You can play around with the quantities. The consistency of the pastry depends on the environment and quality of your flour so please adjust accordingly if it feels too dry or soft. You can use fresh pineapple instead of canned and adapt the quantity of honey (or sugar) according to the sweetness of your fruit. These cookies come out a bit different each time but always delicious. If you make this in advance it freezes up to a year (tightly-wrapped in plastic film). But the pineapple flavour is probably strongest using it immediately. about 1250-1350g/2 and 3/4 to 3lbs drained canned pineapple, with the juice squeezed out – from about 2250g/5lbs undrained canned pineapple, preferably in juice with no added sugar (check the label). You can also use fresh pineapple. 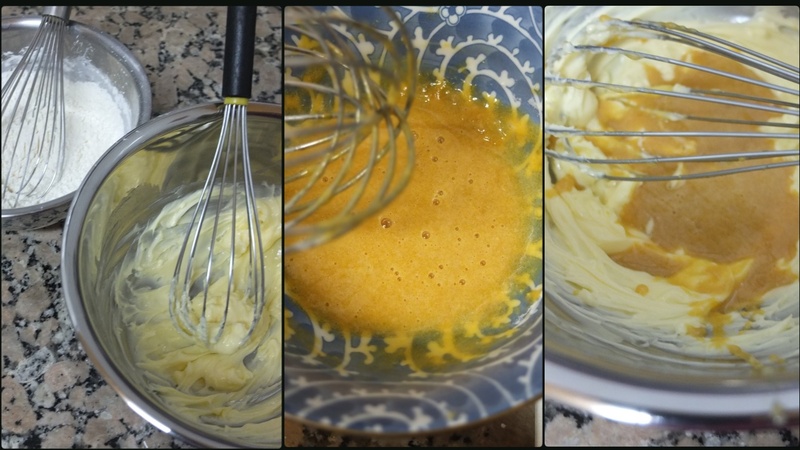 Make the purée rough with very little pieces left in to make the texture more interesting. Use a big heavy-based saucepan like le Creuset. 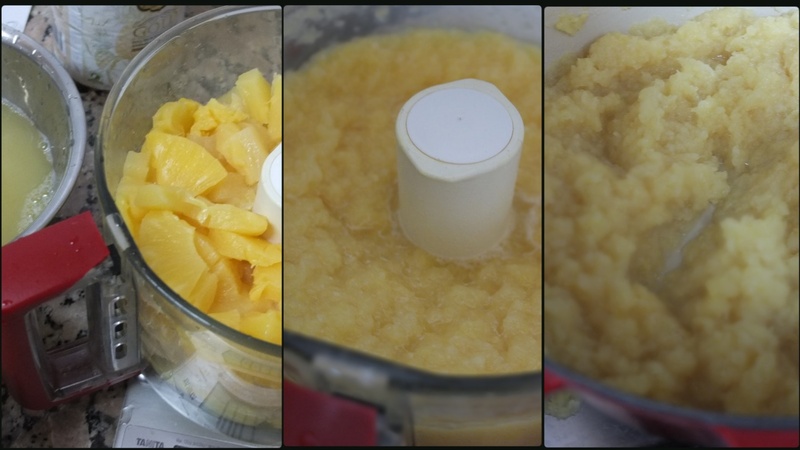 The timings vary depending on your pan, heat and moistness of pineapple so be flexible and check your purée regularly. Lower the heat if it’s going brown too fast. 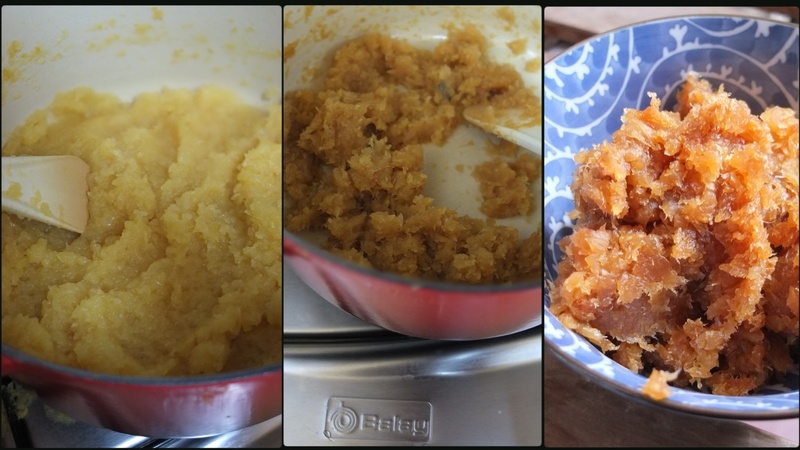 Note: check the purée and stir regularly, even more after adding the sweetener. If it browns underneath quickly stir and incorporate it into the main body of purée. If there’s some black pick out the burnt bits then continue but obviously try to avoid burning (ahem). Towards the end stir every few minutes or continuously. Cool completely before wrapping in pastry. 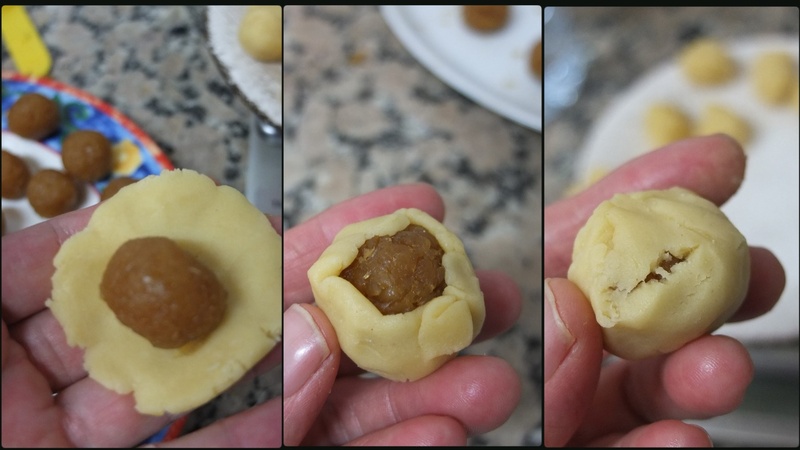 I find it best to make the pastry only 30 minutes before assembly. Even wrapped in plastic it hardens quite fast in the fridge but it probably freezes very well, like most pastry. Option for gluten-free tarts: for 30 cookies replace the cake flour and cornflour with 200g/1 cup plus 2 and 1/2 tbsp gluten-free flour – I use Doves Farm self-raising flour (other gf flours may not work as well – if your mix doesn’t contain xantham gum then add 1/4 – 1/2 tsp xantham gum); for 45 cookies – 300g/1 and 1/2 cups plus 3 and 1/2 tbsp + 1/2 tsp gf flour. 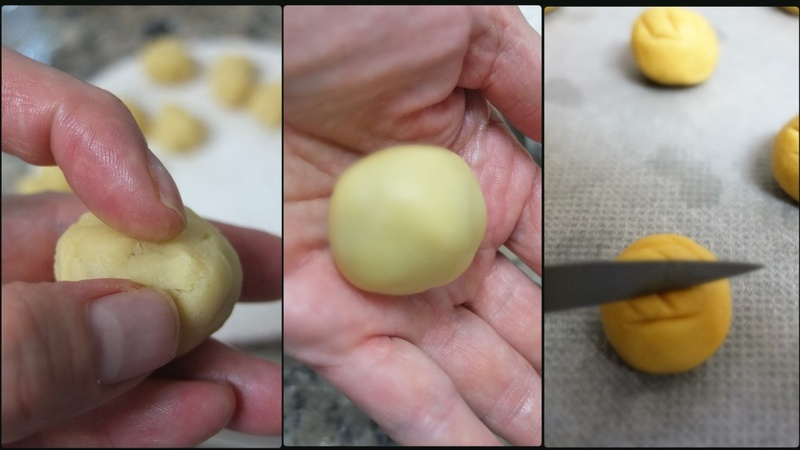 Be flexible and add a little less flour initially then more if necessary to make a soft pastry ball. 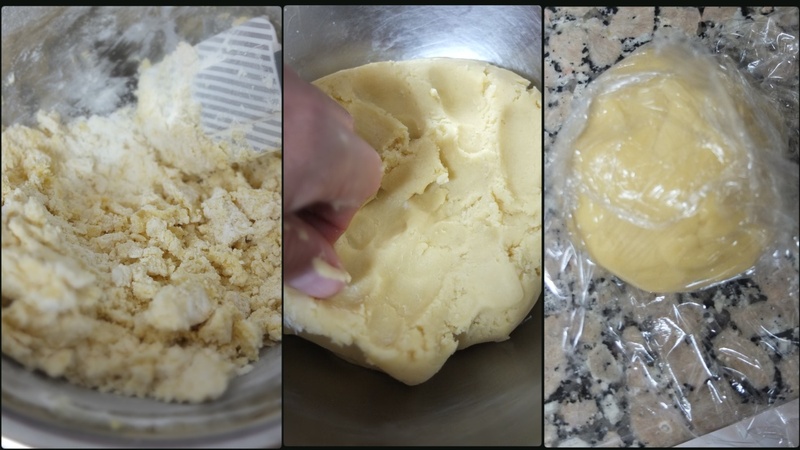 Stir lightly a minute or two for the flour to absorb the moisture so the pastry comes together but don’t overwork. I found if the dough circle cracks then kneading and massaging it a little helps. Be careful to not overbake – a little pale means more melt-in-the-mouth. Wait 15 minutes before eating and they’re best eaten cold. Store in airtight tupperware at room temperature – they’ll keep very well about 1 week. 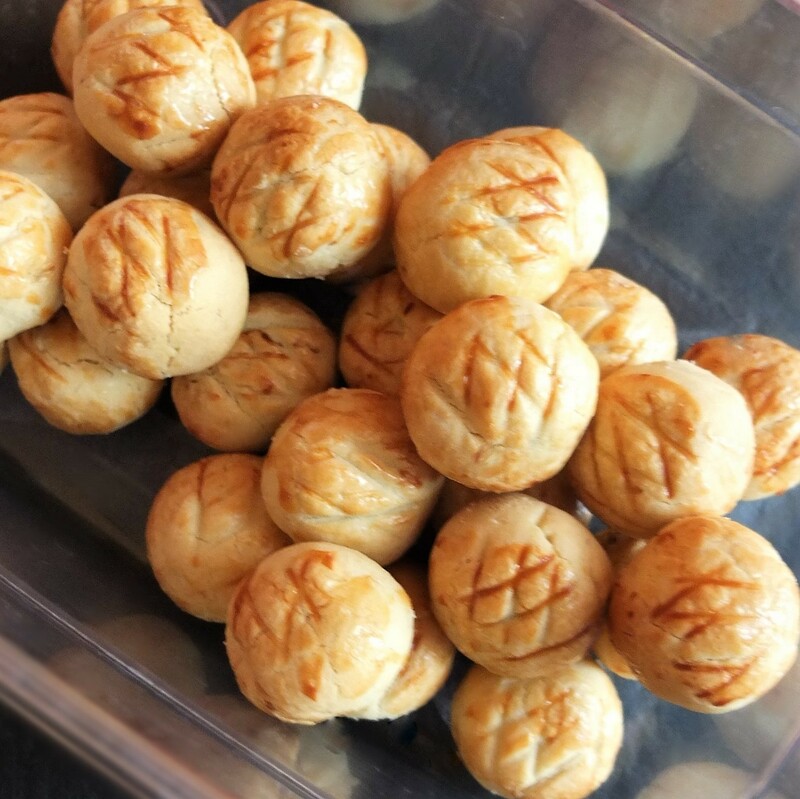 It’s difficult to find anything definitive but the general understanding is these tarts originated in Malacca, a state in Malaysia and they could have Eurasian, Malaysian and Chinese influences. 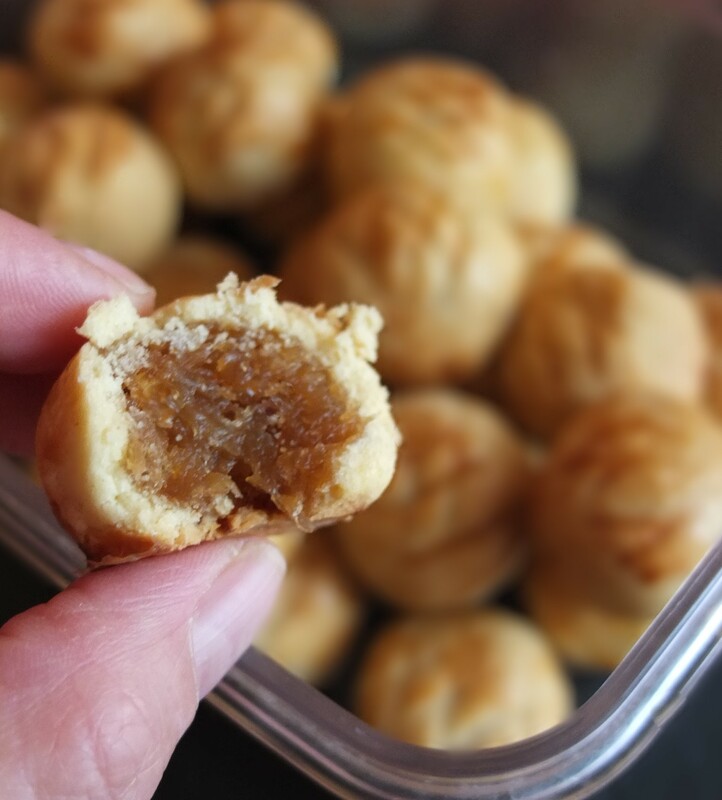 For some related debate go to Pineapple tarts and their Origins on the Kawan Katong website. There’s a theory the origins are Eurasian because of the European techniques of pastry and jam-making. Then a commenter states pineapples are not European but another mentions they originated in South America. To top it all apparently there are similar cookies in Portugal! 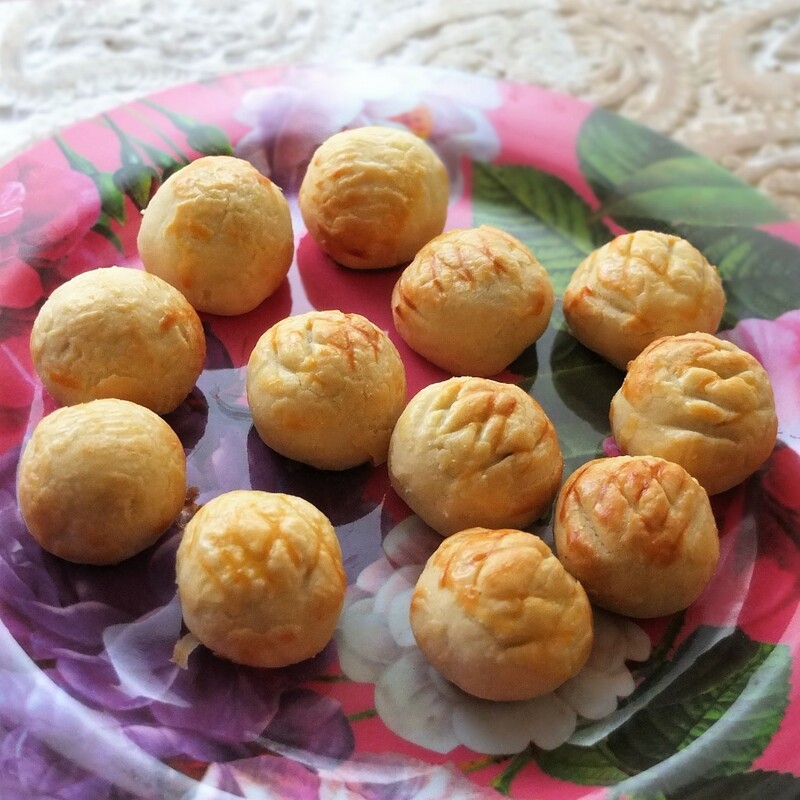 It would be fascinating to discover how pineapple tarts have travelled around the world. But what’s clear is these cookies are such important little treats in different areas of Asia, coming in a variety of shapes, forms and sizes. You can find more detailed information in Wikipedia’s Pineapple tart article. 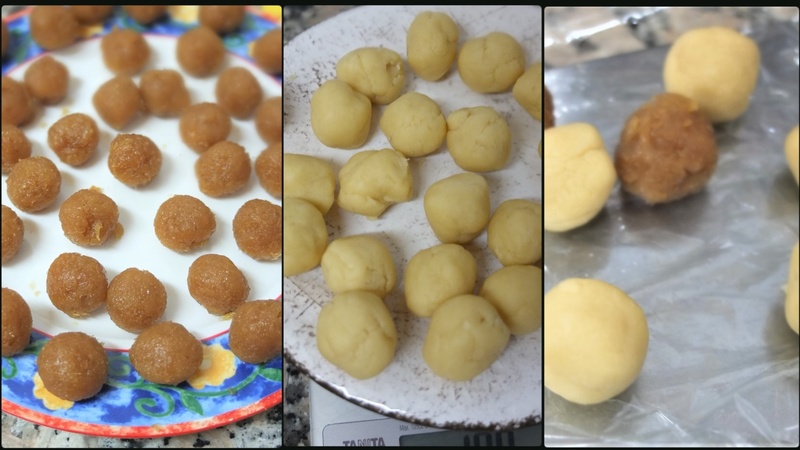 Or look for #pineappletarts on Instagram to see shots of the multiple batches currently gracing Asian kitchens. This Chinese new year is Fire Rooster so some tarts are disguised as chicks sporting red beaks and crests! I’ll be bringing these tarts to Lin’s Chinese New Year Challenge where it will be posted end of February with other participating New Year recipes. 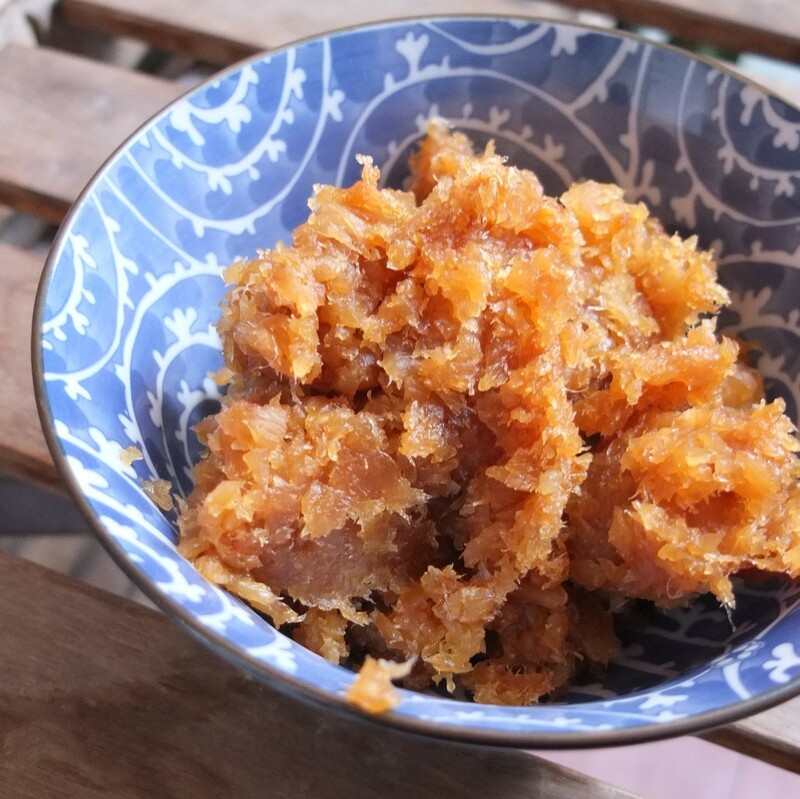 Maybe you’d like to join in and make a dish too? 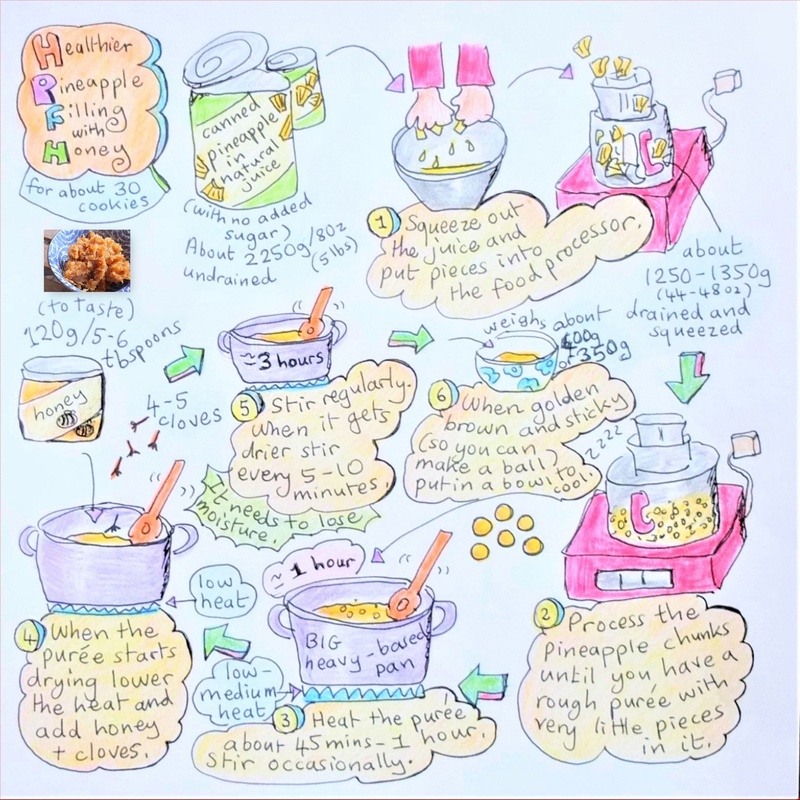 Or just visit Lin’s Recipes and check out her dishes and other interesting challenges! 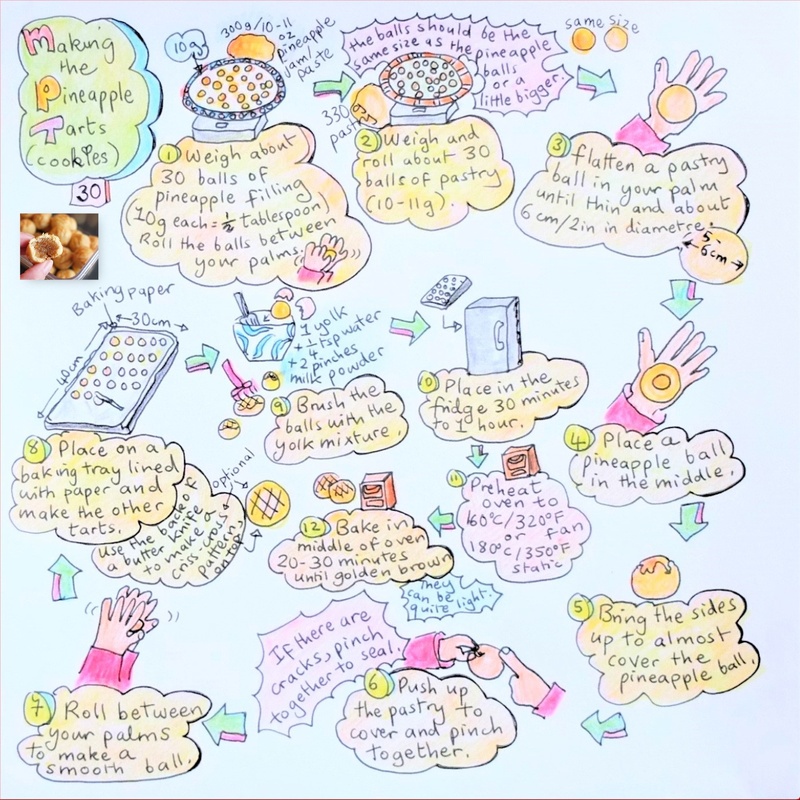 Have a healthier pineapple tart! P.S. Quick photo update to show how these cookies can be shaped at Chinese New Year into relevant animals. Now in 2019 it’s the year of the Pig! The eyes are black sesame seeds and a toothpick makes the holes in the snout. All the pieces stick on easily without needing water. Lili…you have outdone yourself as always….outstanding! Lili these tarts look absolutely outstanding! So cute and delightful! Loved your version of it.. Thanks a lot for paricipating! They are healthy too! What more can a person ask for!! Thank you so much and sorry for such a late reply Lin! And belated thanks for hosting! Don’t know why I didn’t answer you before… oops. 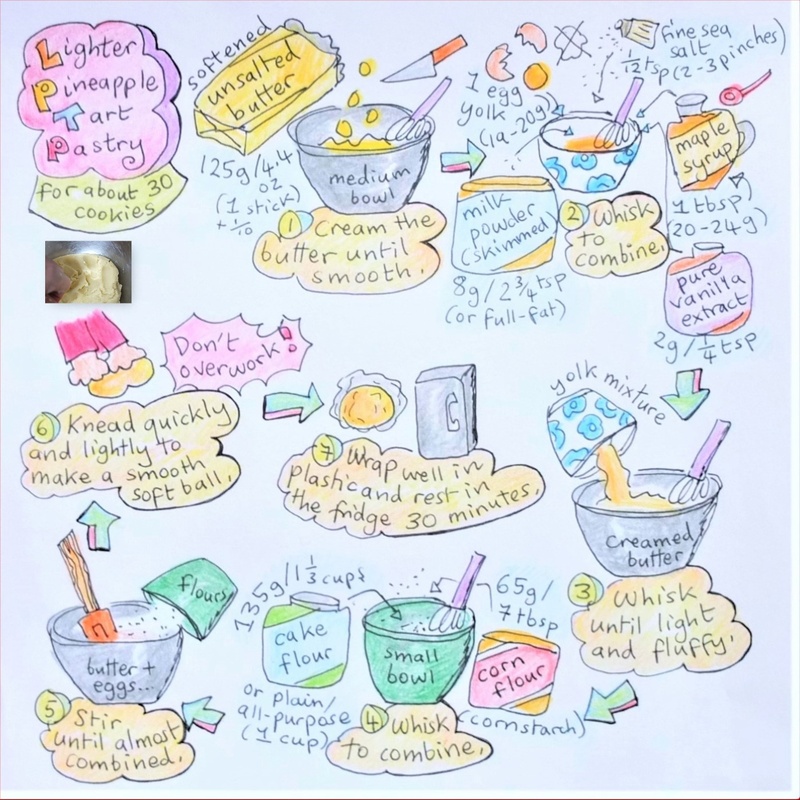 Hi Lili, This is such a lovely recipe. Absolutely love the doodling of the steps.